UPDATE: It appears the code 30forjuly no longer works for this deal. BUT you can use the code FLASH31 to make it $33 instead of $31.50. 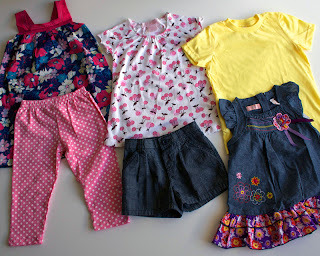 Using the code 30FORJULY, you can get 2 months of kids' clothing delivery service from Wittlebee for only $31.50. This would regularly cost $80! Every box contains about $100 in retail value of clothes. You can see some examples of the clothes you may get here. WittleBee is a monthly clothes delivery service for kids that takes customized information like the age and size of your child and uses it to choose articles of clothing to send you each month. Featuring basic cotton items like onesies, T-shirts, socks, and leggings, this ingenious company takes all the guesswork out of keeping your kids in appropriate apparel. You get at least 6 articles of clothing per box, which works out to be about $2.75 per piece...not a bad price at all for name-brand clothes! Kid clothing rental? Why didn't they have that when my kid was small? That would have been awesome.